Work with one wrapper at a time, and keep the rest covered with a damp towel. Spoon one rounded teaspoon of filling in center. With dampened fingers, wet the four edges. To make a triangle, fold wrapper in half over filling, making sure the ends meet and filling is centered; press edges down firmly to seal. In a 12-inch nonstick skillet with a tight-fitting lid, heat 1 tablespoon oil over medium-high heat. Add half the wontons and cook, turning once, until lightly browned, about 1 minute per side. Carefully add 1/2 cup water (oil may sputter), cover, and steam until translucent and just cooked through, 2 to 3 minutes. Repeat with remaining tablespoon oil and wontons. 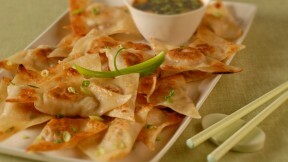 Sprinkle pot stickers with scallions, if using, and serve with soy sauce.